If you’re a sandwich connoisseur and a big fan of Subway, they’ve launched their gourmet paninis. Not only are these savoury paninis available right now, they’re here to stay and enjoy as a part of Subway’s everyday menu. They are served on a new, fresh-baked ciabatta bread. Then they’re filled with quality meats, fresh veggies and warm melted oeey gooey cheese. After that, they are pressed to crispy perfection. Plus, they come in 4 different and delicious combinations. That’s enough to make any sandwich lover swoon. As soon as we heard the news, we wanted to get our hands on a panini! We headed to our nearest Subway and ordered one. Let me tell you, the girls absolutely loved it. Especially the size, the taste of the bread and how crispy it was. Not to mention, they LOVED the sauces too. If you want to see how excited I was, you can check out my video sporting a fun Snapchat panini face lens. You’ll even see my little panini friends and they’ll tell you too. I loved the warmth of the sandwich, the melted cheese and the crispy bread. Plus, the fact that all 4 paninis are free from artificial colours and flavours and topped with a selection of fresh vegetables. Look Out for the Panini Express. 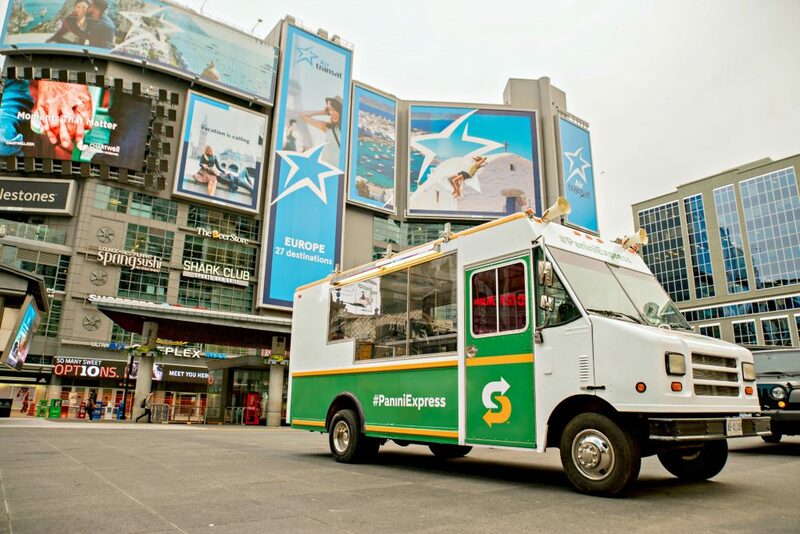 Keep an eye out for the Subway Panini Express, a first-of-its-kind transparent food truck, which will travel from coast to coast to offer samples of delicious paninis to Canadians. The Panini Express began its cross-country tour in Toronto, and will make its way east to Charlottetown and all the way back to Vancouver! You can keep track of the Panini Express’ journey with #PaniniExpress on social. The line-up includes 4 delicious and mouth-watering options. Chipotle Steak & Cheese, Triple Cheese, Chicken Cordon Bleu and the Italian B.M.T. ® Melt. Let’s just say that choosing just one can be a bit difficult. But, since they are a permanent fixture on the menu, I know that I have time to try them all. Believe me, that will be done! I had the Italian B.M.T.® Melt and it was so good. All of the toppings work perfectly together and taste even better when they are warmed up and pressed. 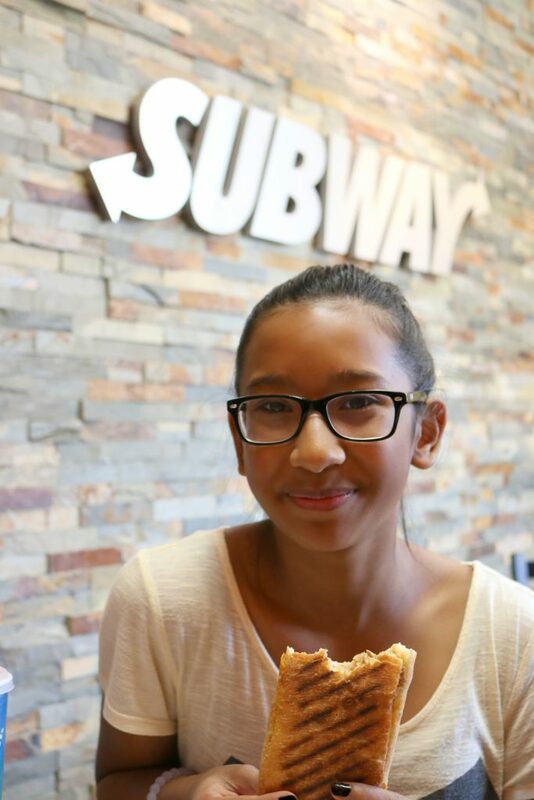 Gabby and Darasak had the Chipotle Steak & Cheese and they said Subway knocked it out of the park. Mimi on the other hand, is going through a picky eating phase and we chose the Italian B.M.T.® Melt for her and she ate half, which for her is a lot for her little belly. She thoroughly enjoyed it and no encouragement was needed, it was down the hatch! What’s Inside the NEW Subway Paninis? Tender, 100 per cent Canadian steak topped with green peppers, red onions and cheddar cheese that’s grilled to perfection on the new ciabatta bread. Think comfort food meets cheesy goodness. Cheddar, Swiss and Monterey cheeses are layered with baby spinach, juicy red tomatoes and crunchy red onions. Layers of Canadian ham, grilled white meat chicken strips and Swiss cheese are topped with baby spinach and tomatoes and drizzled with a creamy honey mustard. The rich flavours of Genoa salami, pepperoni and ham are layered in warm, melty cheddar cheese, all topped with spinach, tomato and red onion and drizzled with house sandwich sauce. 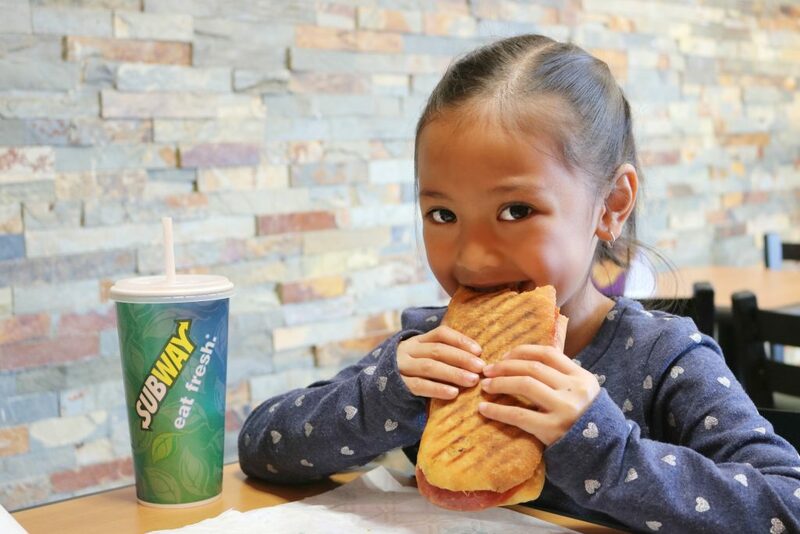 Now it is your turn to try a Subway panini! The new paninis are available across Canada and start at $3.99. There’s a panini with your name on it, so go grab one! For more information, visit subway.com and follow and add to the #SubwayPanini and #PaniniExpress conversation on Facebook and Twitter! Which SUBWAY panini do you want to try first? The chicken cordon bleu sounds delicious! I would try the Italian BMT melt. I first tried the Chicken Cordon Bleu. It was really good! I’d love to try the Italian BMT Melt because it looks delicious! My first choice would be the Chicken Cordon Bleu…My husband has had them and really liked. I would like to try the Chipotle Steak and Cheese panini first. I would love to try the steak and cheese panini! The chipotle steak and cheese panini sounds delish! Chipotle Steak and Cheese would be the panini I first try! Sounds delicious! I tried the Chipotle Steak and Cheese and loved it! I’ve had the Chipotle Steak and Cheese and the Chicken Cordon Bleu already. Prefer the Steak & Cheese. I’d try the Italian B.M.T. Melt first! I would try the Italian B.M.T. melt first. Would love to try out the Chicken Cordon Blue one, sounds yummy! I would try the Chicken Cordon Bleu first! BMT – it is my go-to Subway sandwich. I look forward to trying the Italian BMT Melt from Subway. I enjoy warm sandwiches so this will be a yummy, cheesy choice for sure! I have already tried three of the paninis, all except the three cheese and the steak and cheese is by far my favourite. I’d try the cheese one – a good cheese panini is always a perfect lunch choice! I think I would like to try the chipotle steak and cheese Panini first! Sounds delish !! I would definitely try the chipolte steak and cheese first since I like chipolte and of course you cant beat steak and cheese combos. Ciabatta is one of my favs too so it is a perfect combo. Paninis are really great so it is nice to see subway doing them -they fit really well with what they offer. First one I would try would be the Chicken Cordon Blue one! I love to try the triple cheese SubwayPanini first. 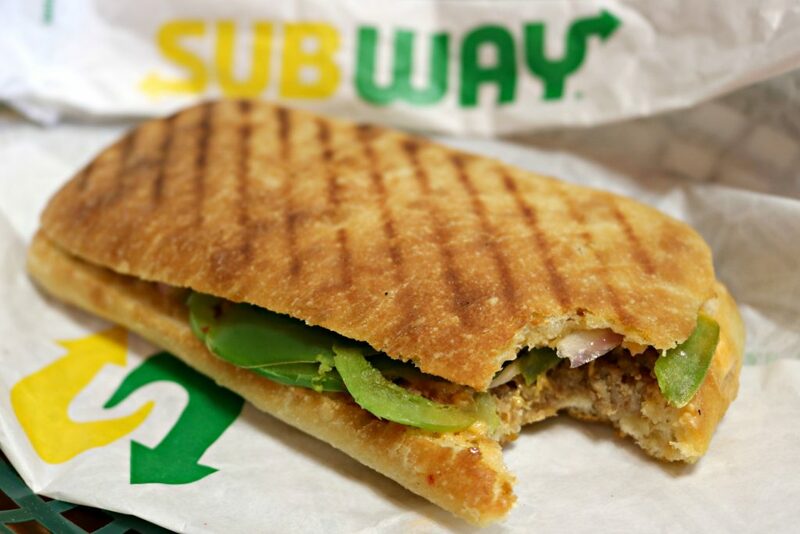 I think I might try the steak and cheese panini first at Subway-looks so good! The Panini that I would try would be the Italian BMT Melt. The Triple Cheese and the Cordon Bleu both sound delicious – don’t know which to choose first! I would love a Chiptolte Steak and Cheese panini! I’d have the 3 cheese panini! I would love to try the Italian B.M.T first. Red onions. I love red onions in sandwiches, pizzas and paninis, They’re not always the easiest to find. I would try the Chicken Cordon Bleu Panini first! Definitely the steak – this is the one I love the most. Thank you. I would go with the Triple Cheese. It sounds like it would be delicious. I would try the three cheese panini first. CHICKEN CORDON BLEU LOOKS SO GOOD IVE NOT TRIED THAT BUT I DID TRY THE STEAK IT WAS REALLY GOOD. I’d love to try the chipotle steak & cheese panini! The Steak & Cheese one sounds good too so it might be a toss up between it and the Chicken Cordon Blue one. I would love to try chipotle steak and cheese! I’d go with Chicken Cordon Bleu Panini. I want to try the chicken cordon blue next. I already tried the chipotle steak & cheese-yummy! I’d first try the Triple Cheese Panini. I would try the chipolte steak & cheese panini first. Yum! Still thinking that the Chicken Cordon Blue would have to be my first pick. I would try the Chipolte steak and cheese first. I would also love to try the Italian BLT melt. I’d like to try the Steak and Cheese panini, too. Would love to have a chipolte steak and cheese right now. The Triple Cheese with all those yummy veggies on crispy bread sounds so good! Chicken cordon bleu looks good. The chicken cordon bleu sounds delicious. I can;t WAIT to try the 3 cheese panini. I love paninis and I’m so glad subway came out with them! I’d go with Chicken Cordon Bleu Panini! The Cheese Panini sounds yummy- I hope that it is all gooey goodness. I love cheese, so it’s the Triple Cheese panini for me! Chicken cordon bleu would be my choice. The cordon bleu catches my eye. Chicken Cordon Bleu would be my first pick. The Triple Cheese and Chicken Cordon Bleu both sound good – don’t know which to try first. I’d go with Chicken Cordon Bleu. I would probably try the Triple Cheese first. I think I’d like the Trip;e Cheese panini! I think I’d like the Triple Cheese panini! Triple cheese would be my choice. Chicken Cordon Bleu would be my pick. An Italian BMT melt sounds delish. I’d go with Chicken Cordon. The chicken corden bleu sounds good. You can never go wrong with steak and cheese. I am going to have to try the Chicken Cordon Bleu one! I think I’d like to try the Triple Cheese first. They all sound worth trying out but I would have to go with the Chicken Cordon Bleu one first. I really want to try the Chicken Cordon Bleu after my university lecture to keep my energy up! I’m looking forward to trying the Triple Cheese panini. I want to try the Steak and Cheese panini. The Steak and Cheese sounds like it would make for a yummy sandwich. Chicken cordon bleu for me! I want to try the Triple Cheese panini, first. Definitely the chicken cordon bleu panini! Sounds fabulous! Chicken Cordon Bleu – sounds yummy to me! any of them to be honest! I definitely need to try out the Chicken Cordon Bleu one! The first one I’d like to try is the Triple Cheese panini. I’d choose Chicken Cordon Bleu. I am a pickle fanatic! The Chicken Cordon Bleu panini sounds like a good one to try next. The Italian BMT Melt sounds delish! I want to try the Steak and Cheese. I love the Italian BMT with extra cheese and onions! The Steak and Cheese sounds great. I would try the Italian BMT melt first. I am looking forward to trying the Italian BMT panini at Subway. Ciabatta is one of my favorite breads. Chicken Cordon Bleu for me, Triple Cheese for hubby! I want to try the triple cheese panini because cheese sandwiches taste so much better when they’re grilled. I’ve already tried the 3 cheese-it was pretty good! I’d also like to try the triple cheese. Triple Cheese and Chicken Cordon Bleu both sound delicious – don’t know which to try first! I’d try the chipotle steak. I would love to try the Italian BLT melt. I would love to try the Three Cheese Panini. The topping that catches my eye is swiss cheese. I would try the triple cheese panini. Cheese as a topping always catches my eye! I’d choose Chicken Cordon Bleu! The Chicken Cordon Bleu panini with swiss cheese and baby spinach sounds delicious. I might try it first! Love cheese so sign me up for the Triple Cheese one! The steak and cheese is my pick. Chicken cordon bleu for me please. Cheese is always one of my favourite toppings. I love cheese, so the Triple Cheese panini is my first choice. They all sound great but I like the Chipolte Steak & Cheese the best! I’d pick the steak and cheese. Chicken Cordon Bleu sounds like the perfect one for me. the chicken cordon bleu for me! I’d choose Chicken Cordon Bleu Panini. I want to try the Chipolte Steak and Cheese. I’d try the Triple Cheese panini first. The Chipotle Steak panini sounds like a tasty sandwich.